Keeping my kids healthy and active is one of our top priorities. Both of our youngest are involved in sports, so it's even more important that they are getting the right nutrition in them daily. I'll be the first to admit, our family is not the healthiest, we love our pizza, greasy burgers and chocolate. I'm not much of a breakfast eater either. Through out this last month, we've been trying to change that, taking one day at a time. To start our day, we try to make it simple and sweet! After all, they say that breakfast is the most important meal of the day. Something the kids and I agreed on is smoothies. It's easy, we can do it together and it provides the nutrients we need to help us get through the day. 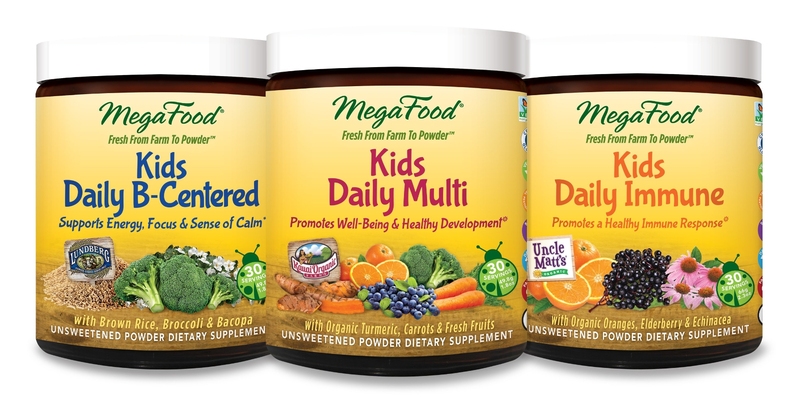 MegaFood powders are perfect to slip in our morning smoothies! We try to base it with as much veggies as possible, adding in some ice and a fruit to help sweeten things up and some MegaFood powder. 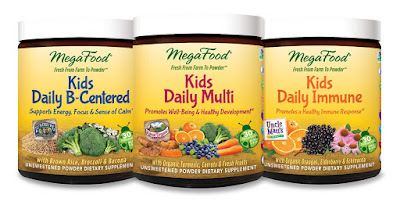 MegaFood uses real food, all natural, farm fresh whole foods. They have partnered with Kauai Organic Farms, Lundbert Family Farms and Uncle Matt's Organic to create these powders that can almost be put in anything. Both of my kids are not pill swallowers, I even couldn't swallow pills until I was in my early 20's. So these powders are a great way to sneak in those needed nutrients.